Doing these shows is always a crap shoot. I know from helping out my wife back when she vended cons, you can do a great at a given show every year and suddenly, boom, bad sales year — for reasons you can almost never really pin down, so you don’t even know what to fix. Had there not been so many extenuating circumstances that significantly increased my costs — namely not having a table partner to split the vending costs and moving to Boston Park Plaza, which was MUCH more expensive to park at — it still wouldn’t have been a fantastic show, but the financial hit I took would have been much smaller. But I’m not here to complain. I post things like this to provide a glimpse into the world of life as a professional writer, which isn’t always as sunny as some indie authors make it sound. It’s work, and sometimes that work doesn’t always pay off as hoped, but all you can do is learn, adapt, and forge ahead. Well-Behaved Women: The current drafts of books two and three are done. Book two is ready for my editor and book three is ready for test-reading. The Adventures of Strongarm & Lightfoot – Scratching a Lich: The audiobook is done and in final processing! It should be available by the end of the month! Action Figures – Issue Eight: Crawling from the Wreckage: Final draft in process. Tentatively scheduled for a February/March 2019 release. Nothing currently scheduled, but I have a couple of things in the works I hope to announce soon. The Final Summons is two weeks away! Pre-order your copy now and then go to TheFinalSummons.com to collect your free swag, including laptop wallpapers and a collection of short stories by the New England Speculative Writers group. My first show of the year is in the books, so to speak. Imagine Books & Brews was happily profitable, which is always nice. And now, onto Arisia 2019! Now, for any aspiring or working audiobook narrators out there, the New England Speculative Writers is auditioning narrators for The Final Summons now on ACX. Head on over and let us hear what you’ve got! Over-the-Counter Culture: Kevin Smith and Clerks – Whittier, Friday, 5:30 PM: Twenty-five years ago, the no-budget B&W indie comedy Clerks was released theatrically and immediately catapulted writer/director Kevin Smith to the pantheon of Gen X icons. Hailed as an important new voice, Smith spent the next quarter century building and catering to a rabid fanbase. He’s still held up by the media as a nerd king, but some look at him today and see wasted potential. We’ll revisit the man and his work, figuring out why Clerks in particular inspired so many. Creating Cover Art – Cabot, Saturday, 2:30 PM: We’re all told not to judge a book by its cover, but in reality, a cover’s artwork plays an important role in attracting new readers. Learn what goes into the design of these covers, including how artists are chosen and what they are given to work with so that they can design artwork that attracts interest, even though it is partially obscured. Writing Fights That Matter – Newbury, Sunday, 1 PM: Fight scenes take many forms in speculative fiction–space battles with improbable physics, wizard duels, and your classic bar scene dust-up, but at heart, a fight is an argument fought without words. This panel will focus on convincing readers that no matter what form your battle takes, the stakes are clear, enormous, and compelling. How can a writer make every fight not just plausible, but memorable? The Best Villains: Creating Satisfying Baddies – Cabot, Sunday, 8:30 PM: Abhor Sauron? Loathe Joffrey? Detest Fred? Speculative literature is filled with antagonists, villains, and scoundrels. How do writers create villains with understandable motivations without romanticizing their terrible deeds? Panelists will use examples from literature to discuss the techniques and challenges of writing memorable evil-doers. Bad Movie Night – Cambridge, Sunday, 10 PM: Sometimes the most fun you can have with a movie is to laugh at it. It’s a longstanding tradition for many to spend a long evening enjoying the work of such production companies as Troma, Full Moon, and The Asylum. Online commentators like Allison Pregler and the folks at RedLetterMedia have made careers out of celebrating the experience of picking apart (while still being entertained by) substandard films. We’ll talk about our favorites, and what makes a movie ideal for this sort of treatment? 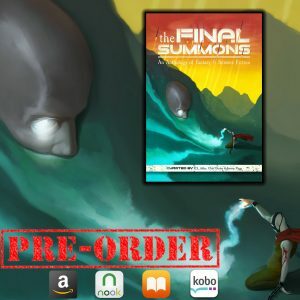 The Final Summons is on pre-sale now through all major book retailers! Get your copy now and then go to TheFinalSummons.com to collect your free swag, including laptop wallpapers and a collection of short stories by the New England Speculative Writers group. You have a little over a month left to act before The Final Summons is released! My first show of the year is this week! If you’re in the Manchester, CT area — it’s in the Hartford area — come by the Army & Navy Club at 1090 Main St. between 6 and 9 PM to say hello, buy some books, and have your copy of Well-Behaved Women – Awakening signed by me and Jen MacPherson, who appears on the front and back covers! THIS WEEK! Imagine Books and Brews – An Imagine Main Street Manchester Event – Multiple locations, Manchester, CT, January 10, beginning at 6 PM. The evening includes a writing workshop, bookmaking class, and vintage book display. Let’s start things with an official countdown to the start of Arisia 2019! It’s a little over two weeks away but they’re going to be a fast two weeks. I’m already making sure everything is packed and ready, and I’ll probably do that again several times before the show. So far there’s been one last-minute change, and that’s to the dealers room. It’s been relocated from the messanine level to the ground level, and will take up studios one and two and the Loft. I am now at table 54, which is dead center of the dealers room. The Adventures of Strongarm & Lightfoot – book four: First draft is back in the works! Time to get cracking on this again and hopefully have a new S&L adventure ready by the fall! NEW EVENT! Imagine Books and Brews – An Imagine Main Street Manchester Event – Multiple locations, Manchester, CT, January 10. I’ll be there with several other indie authors. The evening also includes a writing workshop, bookmaking class, and a vintage book display. 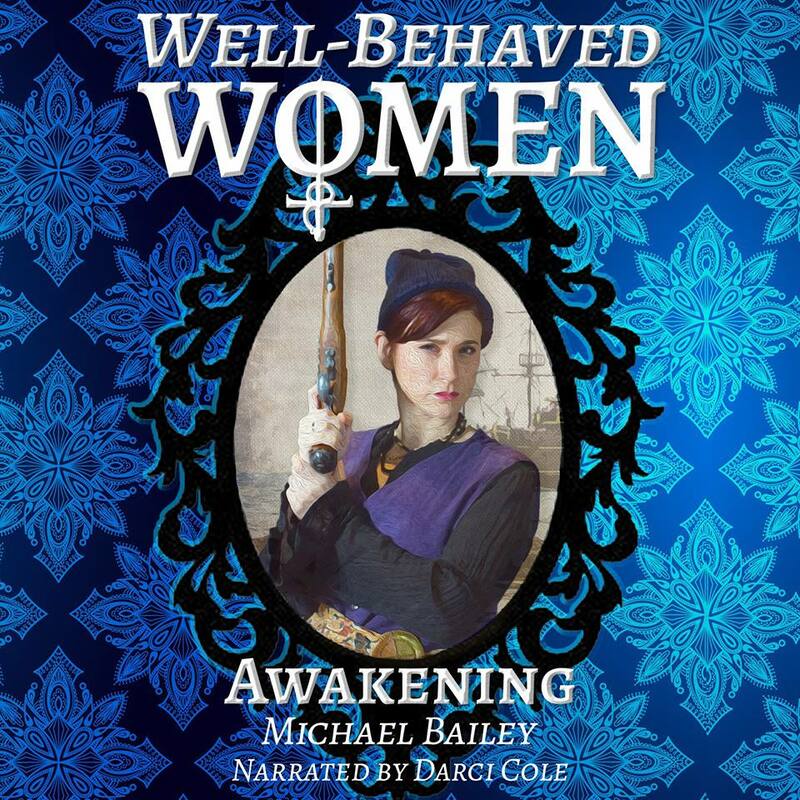 At Last – Part One: The Well-Behaved Women – Awakening audiobook, narrated by Darci Cole, is now on sale! You can get it now on Amazon, Audible, and iTunes! At Last – Part Two: Arisia 2019 news! I have my table assignment AND my draft panel schedule! You can find me at table 46 in the dealers room, which occupies the Georgian, Arlington, Berkley, and Clarendon rooms (the last one is for adult fare, FYI). The Best Villains: Creating Satisfying Baddies – Beacon Hill, Sunday, 8:30 PM: Abhor Sauron? Loathe Joffrey? Detest Fred? Speculative literature is filled with antagonists, villains, and scoundrels. How do writers create villains with understandable motivations without romanticizing their terrible deeds? Panelists will use examples from literature to discuss the techniques and challenges of writing memorable evil-doers. Bad Movie Night – Franklin, Sunday, 10 PM: Sometimes the most fun you can have with a movie is to laugh at it. It’s a longstanding tradition for many to spend a long evening enjoying the work of such production companies as Troma, Full Moon, and The Asylum. Online commentators like Allison Pregler and the folks at RedLetterMedia have made careers out of celebrating the experience of picking apart (while still being entertained by) substandard films. We’ll talk about our favorites, and what makes a movie ideal for this sort of treatment? Well-Behaved Women: The latest draft of book two is complete, draft three of book three is in-progress. 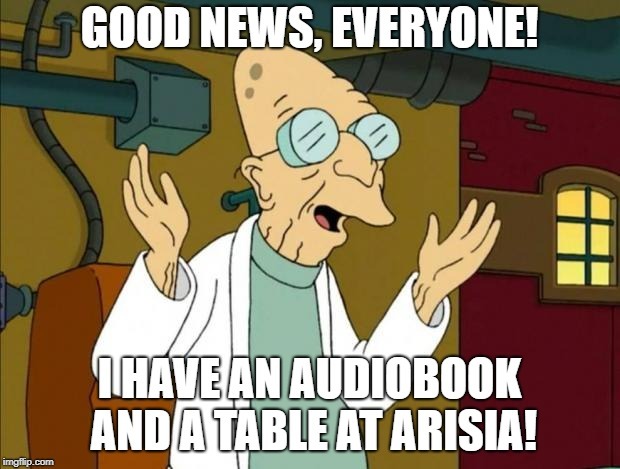 Arisia 2019 – The event has relocated to the Boston Park Plaza Hotel for 2019, but now people signed up for the dealers room are waiting to hear if their space has been downsized or eliminated altogether, because apparently the space for the room is much smaller. Some panels might also get cut. 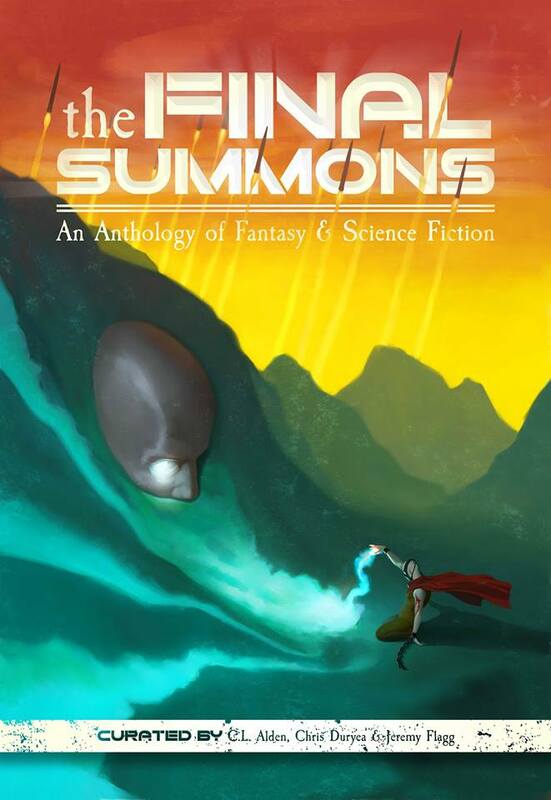 The Final Summons is on pre-sale now through all major book retailers! Get your copy now and then go to TheFinalSummons.com to collect your free swag, including laptop wallpapers and a collection of short stories by the New England Speculative Writers group. As of this morning, the audiobook version of Well-Behaved Women – Awakening is STILL in final processing. The suspense is killing me! As of this morning, the audiobook version of Well-Behaved Women – Awakening is still in final processing. Hopefully I’ll be able to announce its release this week.